Submersible stainless steel pressure transmitter ideal for geotechnical surveying with a 19mm diameter for measuring hydrostatic water level in bore-holes. 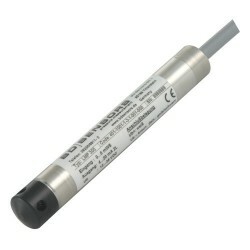 This small diameter level sensor has level ranges from 1 up to 250 metres water column and a 4-20mA current loop output signal. The LMP 305 bore-hole level sensor has a 316 stainless steel body with IP68 sealing for permanent immersion in water. The sensing element is a miniature silicon chip diaphragm which is mounted inside an oil filled capsule to provide a narrow size with enhanced accuracy & sensitivity performance. For level measurement of fresh-water boreholes with diameter restrictions of less than 1 inch the choice of hydrostatic level sensors becomes much more limited since most are typically 1 – 1.5 inches in diameter. If you are also planning to measure shallow water levels the low water head pressure introduces another problem, since small diameter pressure sensor diaphragms are less sensitive at low pressures and this has an impact on the output signal and ultimate level measurement accuracy. So which sensing technology is going to provide the most sensitivity with the smallest diameter? Silicon pressure sensors which incorporate a semiconductor strain gauge have a very small surface areas making them ideal for use inside small diameter pressure sensors. Piezo-resistive silicon strain gauges also offer very high sensitivity to changes in pressure compared to other strain gauge technologies which makes a big difference to pressure sensor performance particularly at lower pressure ranges. The LMP305 borehole level sensor is 19mm in diameter and includes a silicon sensor element packaged in an oil filled capsule with a thin isolation diaphragm. The level ranges available for the LMP-305 borehole level sensor begin with 1 mWG and finish with a 250 mWG. A measurement accuracy of 0.175% full scale best straight line which includes non-linearity, hysteresis & repeatability is specified as standard for the LMP 305 bore-hole level sensor and this can be improved to 0.125% FS if necessary. 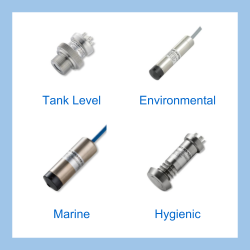 The LMP305 small diameter submersible level sensor has a 316 grade stainless steel sensor housing with a 316L stainless steel isolation diaphragm. 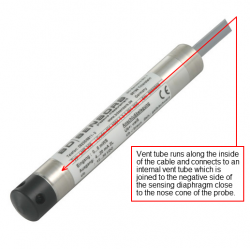 The electrical interface is IP68 rated for long immersion in water and the cable which has a vent tube running through it to provide the gauge pressure reference is available in a PVC, PUR or FEP outer jacket material. The LMP 305 borehole level sensor is powered by 12-36Vdc and it outputs a 4-20mA loop signal for transmitting over long distances between boreholes and telemetry stations. Feed signal to a variable speed drive to control a pump to maintain water level in a borehole. Semi-permanent installations for level measurement of boreholes to test the draw-down of groundwater. 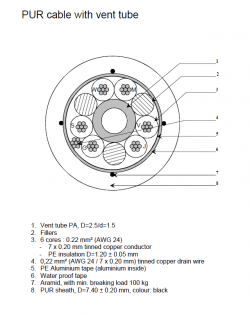 I need to install an 80 metre cable length in a bore hole, which cable type should I use? For 80 metres we would suggest using the PUR type cable which includes kevlar strands running alongside the cable cores to prevent stretching of cable and maintain the calibration position once installed. Will this level probe run off a 24v DC supply? Yes 24Vdc will be fine, the sensor needs anything between 12-36 Vdc to operate. Please bear in mind that this excludes any additional load you will have in the current loop, so any voltage drop from that would need to be deducted from the 24Vdc power supply to determine what is leftover to power the sensor. How do I specify the UOM for this sensor? The standard ranges for this sensor are expressed in bar or mH2O (metres of water column) UOM (units of measure), but other common UOM can be specified such as ftH2O (feet of water column, psi (pounds per square inch). I’m looking for a water level transducer to install in a 25mbgl deep borehole with a RWL of 5mbgl and would need a vented version to compensate for atmospheric pressure. We would suggest a LMP 305 with a 25 metres of water column range to allow you to measure the below ground level at any point away from the rest water level. We would recommend 5 metres of extra cable to allow for installation run at the top of the borehole. Is the calibration reference sea level? For example in my case the bore hole depth is 60m, the pump is at 55 meters, and I’m thinking the depth position of the pressure sensor would be 50 meters so it does not interfere with the pump and can be withdrawn first. But, then we have a depth error of 10 meters? Can this be dialed-in or does the sensor need to go to the very bottom of the well instead? The sensor when installed will only measure the water head above above the sensor where it is located in the borehole. So you could have a 50 mH2O (~5 bar) range if the water level is likely to rise to the top of the borehole. So the range would be 0 to 50 mH2O which would correspond to a 4 to 20 mA output signal. The range is fixed at the factory and cannot be changed in-situ. You would have to scale your signal conditioning instrumentation to make any minor adjustments to the range , such as offsetting by 10 metres. The other option as you pointed out would be to specify a 60 mH2O range and install it at the bottom of the well. The calibration reference or datum is atmospheric pressure, so it is not tied to sea level. The water depth pressure is measured relative to atmospheric pressure. This is made possible by running a vent tube through the inside of the sensor cable to the surface. Since the water depth pressure made up from the hydrostatic pressure and the atmospheric pressure pressing down on the water surface, the vent tube reference will cancel out the atmospheric pressure and the effects of any atmospheric pressure changes. Also it is important to ensure the cable is terminated in a dry but vented enclosure to prevent moisture blocking the vent tube. I am using LMP305 stainless steel probe sensor and have to hang it to a depth of 240 metres. The concern I have is that the combined weight load of the sensor and cable is going to be too much and it will not hold for a long time, and the cable will stretch and become damaged. What do you suggest to protect the cable? The LMP 305 with PUR cable has 4 x Aramid cores within the cable assembly. The Aramid has a breaking strength of 100kg. The LMP 305 with 260m cable will be approx. 15kg so this will be fine. Also bear in mind that the buoyancy of the submerged part of the cable and sensor will reduce the total weight so it could be much less than 15 kg. Does the LMP305 miniature borehole pressure transmitter use a vented cable? 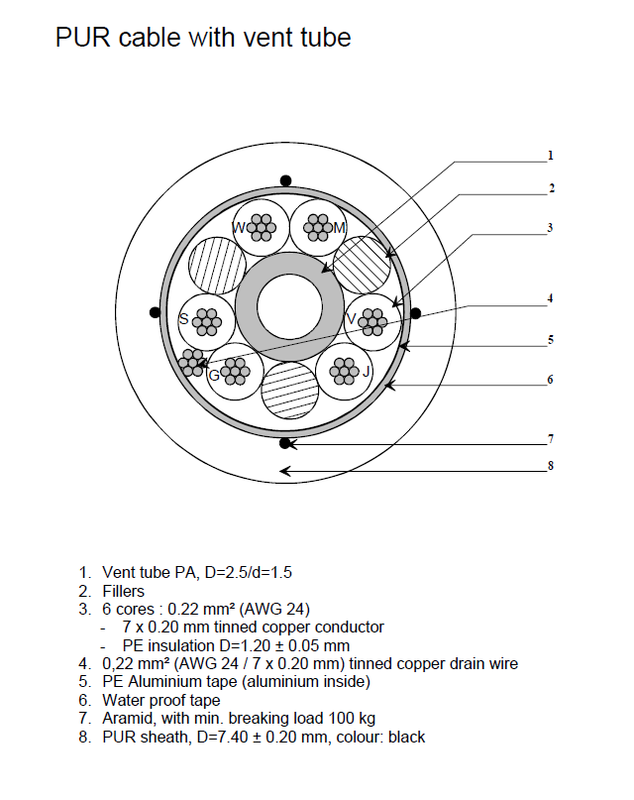 If cable is not vented, how is the atmospheric pressure compensation done? Yes the cable fitted to the LMP305 is vented and connected internally to the reference side of the sensing diaphragm, therefore it will self-compensate for changes in atmospheric pressure. For those sensors which do not have vented cable, the only way to compensate for atmospheric changes is to use a barometric reference at the water surface and subtract the measurements from the water level readings. Please select the options you require for the LMP305 Borehole Level Transmitter in your application and request a quote. Send us your enquiry for LMP305 Borehole Level Transmitter to get assistance with this product type.